"Du Guesclin" redirects here. For the 1948 French film, see Du Guesclin (film). 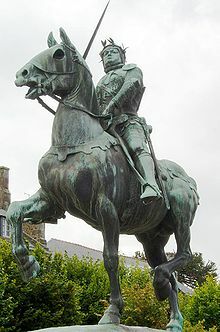 Bertrand du Guesclin (c. 1320 – 13 July 1380), nicknamed "The Eagle of Brittany" or "The Black Dog of Brocéliande", was a Breton knight and an important military commander in the French side during the Hundred Years' War. From 1370 to his death, he was Constable of France for King Charles V. Well known for his Fabian strategy, he took part in six pitched battles and won the four in which he held command. Bertrand du Guesclin was born at Motte-Broons near Dinan, in Brittany, first-born son of Robert du Guesclin and Jeanne de Malmaines. His date of birth is unknown but is thought to have been sometime in 1320. His family was of minor Breton nobility, the seigneurs of Broons. Bertrand's family may have claimed descent from Aquin, the legendary Muslim king of Bougie in Africa, a conceit derived from the Roman d'Aquin, a thirteenth-century French chanson de geste from Brittany. He initially served Charles of Blois in the Breton War of Succession (1341–1364). Charles was supported by the French crown, while his rival, Jean de Montfort, was allied with England. Du Guesclin was knighted in 1354 while serving Arnoul d'Audrehem, after countering a raid by Hugh Calveley on the Castle of Montmuran. In 1356–57, Du Guesclin successfully defended Rennes against an English siege by Henry of Grosmont, using guerrilla tactics. During the siege, he killed the English knight William Bamborough who had challenged him to a duel. The resistance of du Guesclin helped restore French morale after Poitiers, and du Guesclin came to the attention of the Dauphin Charles. When he became King in 1364, Charles sent Du Guesclin to deal with Charles II of Navarre, who hoped to claim the Duchy of Burgundy, which Charles hoped to give to his brother, Philip. On 16 May, he met an Anglo-Navarrese army under the command of Jean de Grailly, Captal de Buch at Cocherel and proved his ability in pitched battle by routing the enemy. The victory forced Charles II into a new peace with the French king, and secured Burgundy for Philip. On 29 September 1364, at the Battle of Auray, the army of Charles of Blois was heavily defeated by John IV, Duke of Brittany and the English forces under Sir John Chandos. De Blois was killed in action, ending the pretensions of the Penthievre faction in Brittany. After chivalric resistance, Du Guesclin broke his weapons to signify his surrender. He was captured and ransomed by Charles V for 100,000 francs. In 1366, Bertrand persuaded the leaders of the "free companies", who had been pillaging France after the Treaty of Brétigny, to join him in an expedition to Spain to aid Count Henry of Trastámara against Pedro I of Castile. In 1366, du Guesclin, with Guillaume Boitel, his faithful companion, leader of his vanguard, captured many fortresses (Magallón, Briviesca and finally the capital Burgos). After Henry's coronation at Burgos, he proclaimed Bertrand his successor as Count of Trastámara and had him crowned as King of Granada, although that kingdom was yet to be reconquered from the Nasrids. Bertrand's elevation must have taken place at Burgos between 16 March and 5 April 1366. But Henry's army was defeated in 1367 by Pedro's forces, now commanded by Edward, the Black Prince, at Nájera. Du Guesclin was again captured, and again ransomed by Charles V, who considered him invaluable. However, the English army suffered badly in the battle as four English soldiers out of five died during the Castilian Campaign. The Black Prince, affected by dysentery, soon withdrew his support from Pedro. Du Guesclin and Henry of Trastámara renewed the attack, defeating him at the decisive Battle of Montiel (1369). After the battle, Pedro fled to the castle at Montiel, from whence he made contact with du Guesclin, whose army were camped outside. Pedro bribed du Guesclin to obtain escape. Du Guesclin agreed, but also told it to Henry who promised him more money and land if he would only lead Pedro to Henry's tent. Once there, after crossed accusations of bastardy, the two half-brothers started a fight to death, using daggers because of the narrow space. At a moment when they fought on the floor, Pedro got the upper side and was about to finish Henry. But then Du Guesclin, who had stayed inactive for he was compromised to both, made his final choice. He grabbed Pedro's ankle and turned him belly-up, thus allowing Henry to stab Pedro to death and gain the throne of Castile. While turning Pedro down, du Guesclin is claimed to have said "Ni quito ni pongo rey, pero ayudo a mi señor" (I neither put nor remove a King, but I help my Master), which has since that moment become a common phrase in Spanish, to be used by anyone of lesser rank who does what he is ordered or expected to do, avoiding any concern about the justice or injustice of such action, and declining any responsibility. Bertrand was made Duke of Molina, and the Franco-Castilian alliance was sealed. Du Guesclin's coat of arms. War with England was renewed in 1369, and Du Guesclin was recalled from Castile in 1370 by Charles V, who had decided to make him Constable of France, the country's chief military leader. By tradition this post was always given to a great nobleman, not to someone like the comparatively low-born Du Guesclin, but Charles needed someone who was an outstanding professional soldier. In practice du Guesclin had continual difficulties in getting aristocratic leaders to serve under him, and the core of his armies were always his personal retinue. He was formally invested with the rank of Constable by the King on 2 October 1370. He immediately defeated an English army led by Robert Knolles at the Battle of Pontvallain and then reconquered Poitou and Saintonge forcing the Black Prince to leave France. In 1372, the Franco-Castillan fleet destroyed the English fleet at the Battle of La Rochelle where more than 400 English knights and 8000 soldiers were captured. Master of the Channel, du Guesclin organized destructive raids on the English coasts in retaliation for the English chevauchées. Du Guesclin pursued the English into Brittany from 1370 to 1374, and defeated again the English army at the Battle of Chizé in 1373. He disapproved of the confiscation of Brittany by Charles V in 1378, and his campaign to make the duchy submit to the king was halfhearted. 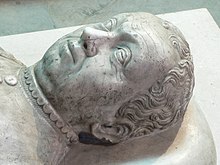 An able tactician and a loyal and disciplined warrior, Du Guesclin had reconquered much of France from the English when he died of illness at Chateauneuf-de-Randon while on a military expedition in Languedoc in 1380. He was buried at Saint-Denis in the tomb of the Kings of France. His heart is kept at the basilica of Saint-Sauveur at Dinan. Because of du Guesclin's allegiance to France, 20th century Breton nationalists considered him to be a 'traitor' to Brittany. During World War II, the pro-Nazi Breton Social-National Workers' Movement destroyed a statue of him in Rennes. In 1977 the Breton Liberation Front destroyed a statue of him in Broons. ^ Vernier, Richard (2003). The Flower of Chivalry: Bertrand du Guesclin and the Hundred Years War. Woodbridge: Boydell Press. p. 18. ISBN 978-1-84383-006-1. ^ Jones, M., ed. (2004). Letters, Orders and Musters of Bertrand Du Guesclin (1357–1380). Woodbridge: Boydell Press. ISBN 978-1-84383-088-7. p. xviii, n. 19, citing Marius Canard (1929), "L'origine sarrazine de Bertrand du Guesclin", Revue Africaine (Algiers), pp. 1–26. ^ Guesclin "100000 francs - My library - Google Books. Books.google.com. Retrieved 2011-12-16. ^ Michael Jones, ed. (2004), Letters, Orders and Musters of Bertrand Du Guesclin (1357–1380) (Woodbridge: Boydell Press), p. 56, doc. 150. ^ Vernier 2003, pp. 138–146. ^ "Histoire de Du Guesclin" (in French). Broons.fr. Retrieved 2019-01-13. Wikimedia Commons has media related to Bertrand du Guesclin.